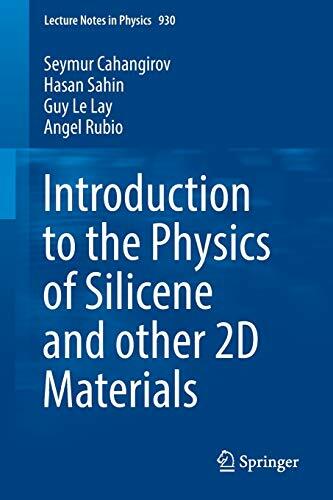 [PDF] Introduction to the Physics of Silicene and other 2D Materials (Lecture Notes in Physics) | Free eBooks Download - EBOOKEE! Description: This concise book offers an essential introduction and reference guide for the many newcomers to the field of physics of elemental 2D materials. Silicene and related materials are currently among the most actively studied materials, especially following the first experimental synthesis on substrates in 2012. Accordingly, this primer introduces and reviews the most crucial developments regarding silicene from both theoretical and experimental perspectives. At the same time the reader is guided through the extensive body of relevant foundational literature. The text starts with a brief history of silicene, followed by a comparison of the bonding nature in silicon versus carbon atoms. Here, a simple but robust framework is established to help the reader follow the concepts presented throughout the book. The book then presents the atomic and electronic structure of free-standing silicene, followed by an account of the experimental realization of silicene on substrates. This topic is subsequently developed further to discuss various reconstructions that silicene acquires due to interactions with the substrate and how such effects are mirrored in the electronic properties. Next the book examines the dumbbell structure that is the key to understanding the growth mechanism and atomic structure of multilayer silicene. Last but not least, it addresses similar effects in other elemental 2D materials from group IV (germanene, stanane), group V (phosphorene) and group III (borophene), as well as transition metal dichalcogenides and other compositions, so as to provide a general comparative overview of their electronic properties. No comments for "[PDF] Introduction to the Physics of Silicene and other 2D Materials (Lecture Notes in Physics)".